How to cook a thick sauce with the meat? 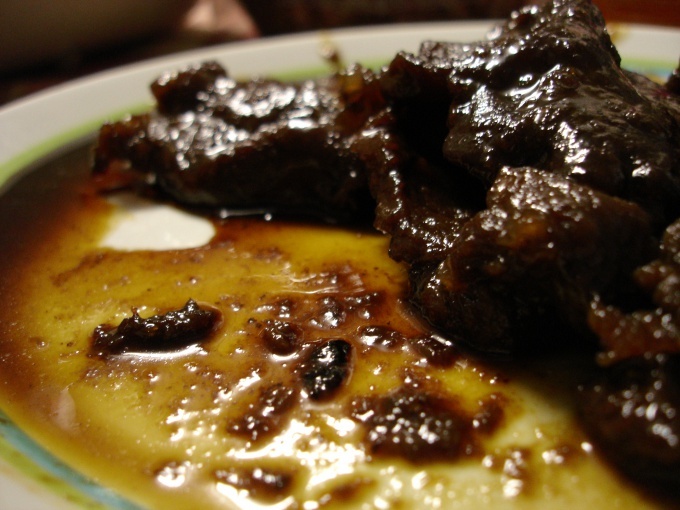 Gravy is a saucethat is used to sabriana second courses, as well as to give them taste and flavor. Options for making the gravy very much. Gravy with flour - one of the most simple to prepare and at the same time one of the most delicious gravies. Pour into a small saucepan a small amount of milk, dilute it one third with water. Bring to a boil, then add in a saucepan the butter, spices and salt to taste. In a separate bowl mix a tablespoon of flour in a little water so that lumps don't form. Pour the flour in a thin stream into the gravy. Reduce the heat and stir the gravy until it is thick. Instead of milk you can use sour cream. The proportions of every woman selects for herself, as some like the gravy thicker, others liquid. You can add to the gravy tomato paste - get a beautiful and tasty tomato sauce. Another method of cooking the gravy with flour - pour into the pan vegetable oil, and lightly fry in the tablespoon of flour. Then add to the flour sour cream and mix everything carefully. Then pour into the pan broth or water and bring the gravy to a boil. Add to the gravy tomato paste or spices and salt to taste. Another version of the gravy - sauce with vegetables and herbs. Pan-fried carrot, onion and tomato until tender, then pour into the pan half a Cup of water and pre-diluted in water tablespoon of flour. Bring the gravy to a boil, add spices and chopped greens. In such a gravy out of the meat. Very delicate gravy with flour obtained by the following recipe. Stir 2st.l. flour in 0.5 l of cream. Pour the mixture into a frying pan with high edges. Heat the pan on low heat. Add in gravy 200g grated cheese 2 cloves grated garlic. Gravy should stir and cook until then, until the cheese is completely melted.